Write a program or function which will provably print all integers exactly once given infinite time and memory. The output must be in decimal, unless your language does not support decimal integer (in that case use the natural representation of integers your language uses). Your program has to work up to the numbers with the biggest magnitude of the standard integer type of your language. Each integer must be separated from the next using any separator (a space, a comma, a linebreak, etc.) that is not a digit nor the negative sign of your language. The separator must not change at any point. The separator can consist of multiple characters, as long as none of them is a digit nor the negative sign (e.g. , is as valid as just ,). Any supported integer must eventually be printed after a finite amount of time. Try it online! Check Debug to see the generated SBIN code. The binary file above has been generated by assembling the following SASM code. Haskell allows infinite lists natively. Printing such a list will prints its elements one a time forever. This makes use of the cell wrapping and prints all possible values. In Brainfuck, the native integer representation is by byte value. Test it online! You can now adjust the speed if you want it to run faster or slower. O Print the TOS (top-of-stack) as an integer. At the beginning of the program, the stack contains infinite zeroes, so this prints 0. 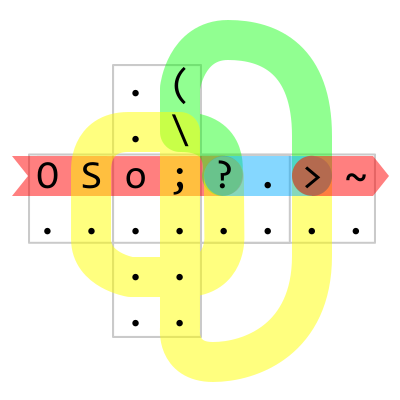 S Push 32, the char code for the space character. o Print the TOS as a character. This prints a space. ; Pop the TOS. Removes the 32 from the stack. Now the IP hits the ?, which directs it left, right, or straight depending on the sign of the TOS. Right now, the TOS is 0, so it goes straight. This is the blue path; . does nothing, and the IP hits the arrow >, which directs it east along the red path again. ~ takes the bitwise NOT of the TOS, changing it to -1. Here the IP reaches the right edge of the net, which wraps it back around to the left; this again prints the TOS (this time -1) and a space. Now the IP hits the ? again. This time, the TOS is -1; since this is negative, the IP turns left, taking the green path. The mirror \ deflects the IP to the (, which decrements the TOS, changing it to -2. It comes back around and hits the arrow; ~ takes bitwise NOT again, turning the -2 to 1. Again the TOS is outputted and a space printed. This time when the IP hits the ?, the TOS is 1; since this is positive, the IP turns right, taking the yellow path. The first operator it encounters is S, pushing an extra 32; the ; pops it before it can cause any trouble. Output the current number and a space. If the current number is negative, decrement it by 1. Take bitwise NOT of the current number. Ajax:Be me without myself.Open thy heart. Ajax:Be thyself and ash.Open thy heart.Be me times you.Open thy heart.Be me times you.Let us return to scene II. Obviously, this answer is nowhere near winning, but I liked that this is a use case that the SPL is comparatively well suited to. // Everything before the first dot is the play's title, the parser treats it as a comment. // Dramatis personae. Must be characters from Shakespeare's plays, again with a comment. // but for the sake of golfing I didn't give them any. // This scene would've been named "You are nothing"
// Characters can assign each other values by talking. Nice nouns = 1, ugly nouns = -1. // Working title "The circle of life"
Prints 0, -1, 1, -2, 2 ... separated by newlines. Given an infinite tape would theoretically run forever. This makes use of the cell wrapping and prints all possible values. In SAF, the native integer representation is by byte value. This is most likely the longest solution, since sed has no integer type or arithmetic operations. As such, I had to emulate an arbitrary size increment operator using regular expressions only. Golfed one byte thanks to @JDL. Since in Java 2147483647 + 1 = -2147483648, we can't simply do i++ and continue infinitely, since the challenge was to print all numbers once. With the above code with added range, it will instead print all integers from -2147483648 to 2147483647 once each, in the following sequence: 0, -1, 1, -2, 2, -3, 3, -4, ..., 2147483646, -2147483647, 2147483647, -2147483648. Thanks to @OlivierGrégoire for pointing out Java's behavior regarding MIN_VALUE-1/MAX_VALUE+1. Try it here. Because of the r command it needs GNU-DC or OpenBSD-DC. This version is abusing the stack length as counter while letting the stack grow. Prints numbers separated by newlines. -3 bytes from @manatwork. -3 bytes from @m-chrzan. will display all integers between -9007199254740991 and 9007199254740992.
will display all integers, given infinite time and memory. ... and so on. The separator is a newline. Re-written after reading @xnor's answer to use a version of that algorithm. Starting at n=1, the program prints 1-n and n, each followed by a newline, before incrementing n. After overflowing the maximum value the program will end with an error of something smells fishy.... Exactly when this will happen depends on the interpreter implementation. Starting at 0, the program loops indefinitely. On each loop, the current value is printed along with a newline. It is then negated, and incremented if positive. Edit: 1 byte less thanks to Digital Trauma. Adding to the diversity of languages used so far, I present a bc solution that works with integers of arbitrary size. A newline is required after the code and it is counted in the bytes total. In the first iteration i is not defined, but printing it gives 0 to my surprise. If the top of the stack is positive, turn right. If the top of the stack is zero, keep moving straight ahead. If the top of the stack is negative, turn left. When the IP hits a dead end, it turns around (executing the command at the end only once). And the IP starts in the top left corner moving east. Also note that the stack is implicitly filled with an infinite amount of zeros to begin with.
! Print top of stack (0). `    Multiply by -1 (still 0).
! Print top of stack (-1). `   Multiply by -1 (1). This time, the top of the stack is positive, so IP turns right (west) and immediately executes another iteration of the main loop, which prints the 1. Then after it is negated again, we hit the : with -1 on the stack. This time the IP turns left (east). The " is just a no-op and the IP turns around in the dead end. : makes another copy and this time the IP turns south. ( decrements the value to -2, the IP turns around again. With the top of the stack still negative, the IP now turns west on the : and does the next iteration of the main loop. In this way, the IP will now iterate between a tight loop iteration, printing a positive number, and an iteration that goes through both dead ends to decrement the value before printing a negative number. You might ask yourself why there's the " on the second line if it doesn't actually do anything: without it, when the IP reaches : on a negative value, it can't turn left (east) so it would turn right (west) instead (as a rule of thumb, if the usual direction at a junction isn't available, the IP will take the opposite direction). That means the IP would also never reach the ( at the bottom and we couldn't distinguish positive from negative iterations. Saved 1 byte thanks to Patrick Roberts! Saved 2 bytes thanks to Conor O'Brien! Covers all 32-bit [int] values, as that's the default number type for PowerShell. Prints 0, then loops up to 2gb (which is a special operator, not a constant, yielding 2147483648). Must be called as a full program so that $i properly defaults back to $null. For a truly infinite variation that will (eventually) print every single integer in existence given infinite time and memory, try the above. We simply tack on the [bigint] cast and change slightly how the loop is calculated. Not the answer you're looking for? Browse other questions tagged code-golf number integer or ask your own question.